Great Clips for Hair is a famous hair salon. The company operates through more than 3000 locations scattered across the United States. Apart from its main office, it also owns corporate offices located in Kirkland, WA and other key locations. It was established in the year 1982 and year after year the number of franchised salons increased from 150 salons in the year 1988 to 3000 salons in 2011. The company also launched check-in application, which allows its customers to check the wait list, so that they can find out about their wait time before visiting the salon. This made it more convenient for the customers. There are currently 0 consumer reviews about Great Clips for Hair available. Share your review. 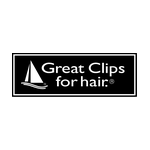 Please take a note that you are about to post a public review about Great Clips for Hair corporate office on CorporateOffice.com. This review will be public, so please do not post any of your personal information on this website. If you would like to contact the corporate offices of Great Clips for Hair, please use their contact information such as their phone number, website, and address listed above to contact them. However, sometimes staff from Great Clips for Hair headquarters do read the reviews on this website.